If you’re lucky enough to live in an area where you never worry about dropping a call while driving, read no further! 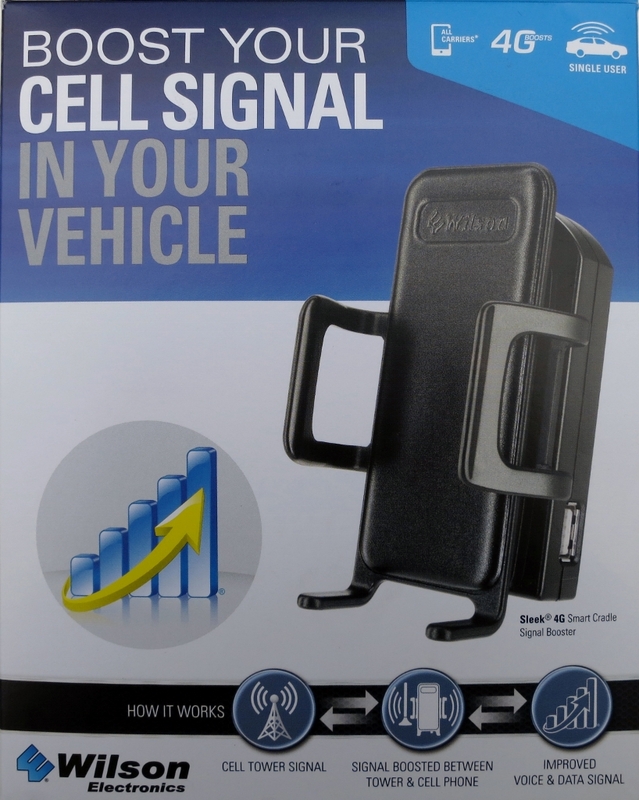 Otherwise, you might well be interested in the Sleek 4G cellular signal booster, formerly from Wilson Electronics. 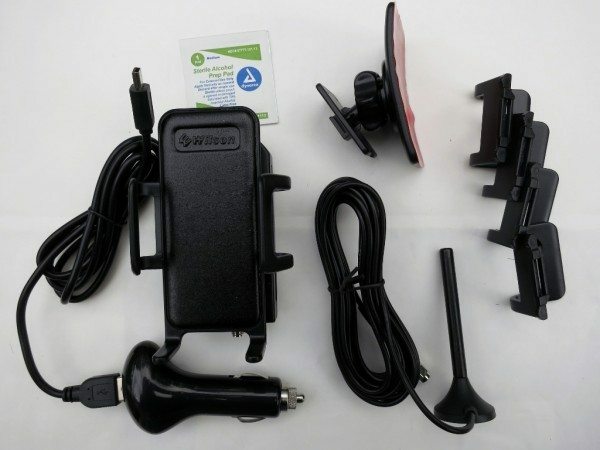 Both the company and the product have recently been rebranded, so the product is now called Drive 4G-S Vehicle Cell Phone Signal Booster from weBoost. I’m reviewing the Sleek 4G product as received, and will call it by that name, but will use the new weBoost vendor name throughout the review. 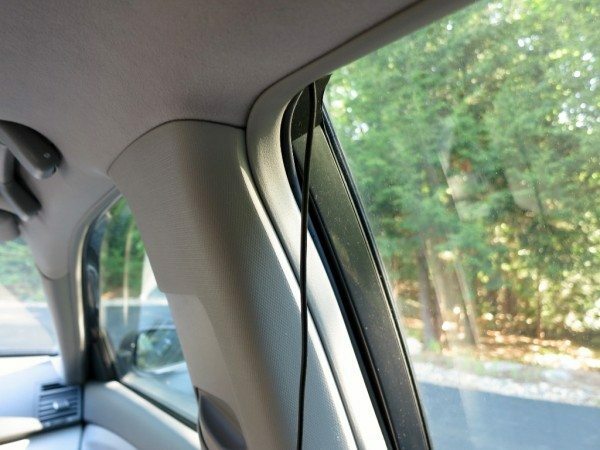 The Sleek 4G installs in your car and provides a substantial boost to your signal strength. Living on the edge, as I do – of cellular range, not lifestyle! – I drop calls all the time. 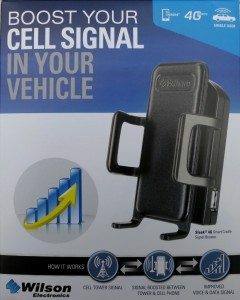 In fact, we tell people who are planning to visit us that “if you’re lost and you can’t place a call to ask for directions, then you’re probably really close!” So, I was really intrigued at the potential for this gadget to make life easier for me and people I talk to while driving around. 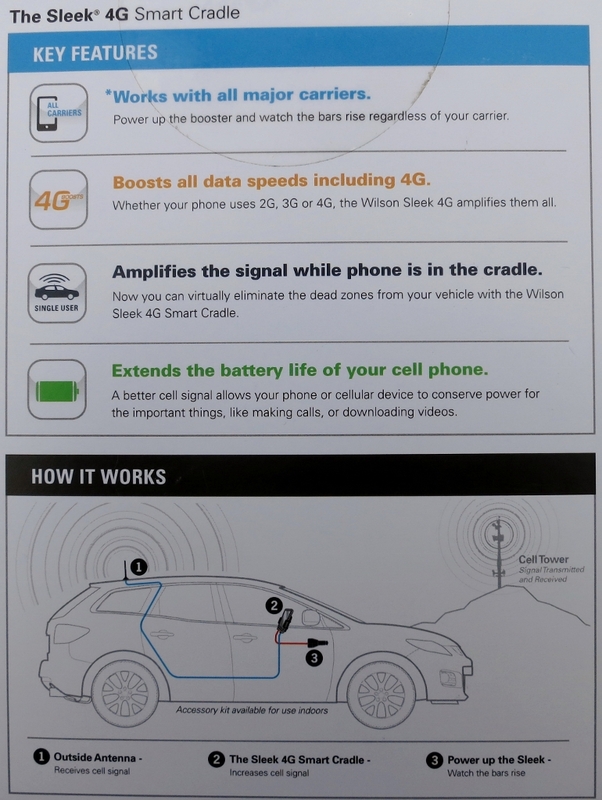 The back of the product box promotes the features and provides a brief schematic of how the cell booster works. The key feature is that the Sleek 4G boosts cell signal – including 4G LTE – for all major U.S. and Canadian cell carriers. From the schematic, you can see that the basic idea is that an external antenna receives the cell signal and passes it through a wire to a powered cradle which boosts the signal into the phone in the cradle. The phone is not connected by wire but must be in close proximity (i.e. in the cradle) for the product to work. Here are the components of the Sleek 4G. There is a magnetic antenna with a 12’ cable. 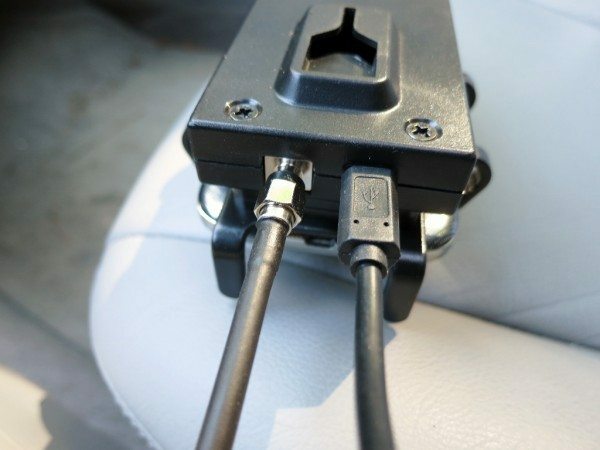 The cable’s mini-coaxial connector attaches to the cradle, as does a USB power cable and adapter that plugs into the vehicle’s 12V DC power source. 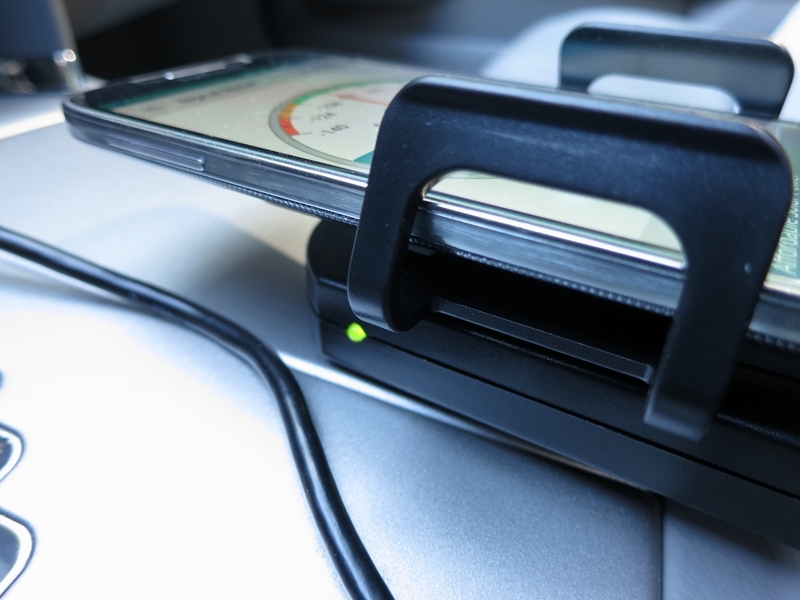 The cradle itself is supposed to be mounted to the dash of the car with an adhesive mount. The cradle comes with three different-sized sets of adjustable arms that, in theory, can be swapped and adjusted to fit most phones. 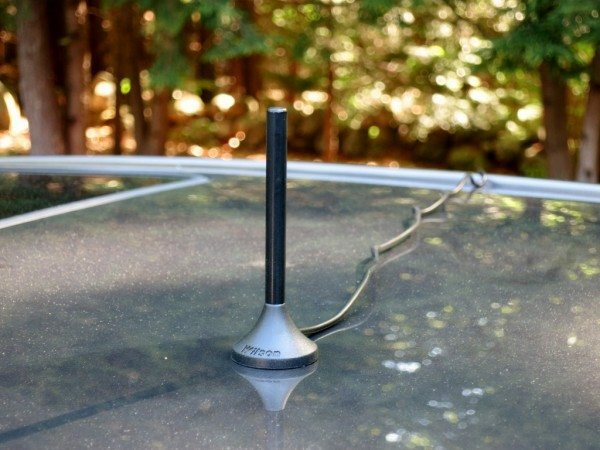 First, I attached the antenna to the roof of the car, at least six inches from windows and my sunroof. I then ran the coaxial cable into the car through the top of the right rear door. The instructions state that the cable is thin enough that the door should not harm the cable, but does recommend that you loosen the door seal and run the cable under the seal for extra protection. I figured I’d do this if I liked the Sleek 4G enough to make it a permanent feature. The cable then needs to make its way to the front center of the car to be driver-accessible. A professional installer could possibly do this unobtrusively. I’m not a professional installer. I let the cable drop to the floor alongside the center pillar, then ran the cable under the seat to the center console. It’s not pretty. That said, I mostly drive alone and almost never with rear-seat passengers. Except for a couple of times where I decided to put groceries in the back seat from the driver side instead of the passenger side to avoid re-closing the door on the cable, I honestly didn’t notice the cable. I did notice the cable nest at the cradle, however. 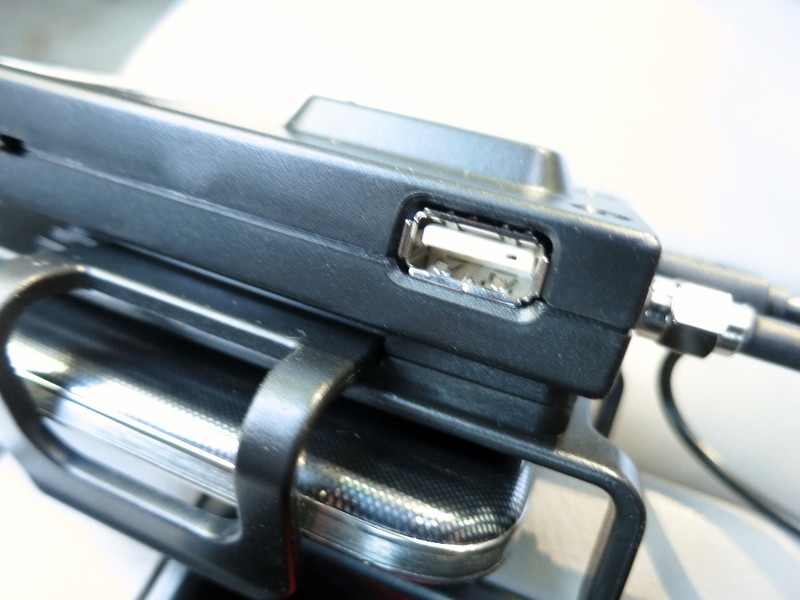 The cradle has three cable ports. On the bottom is the mini-coax port for the antenna and a micro-USB port for power. On the side is a USB port that can be used to charge your phone. It’s handy to have the charging port available, particularly if the Sleek 4G DC adapter is hogging your only 12V power outlet. I have a pair of outlets, one hidden and one exposed, so I just plugged the adapter into the unused exposed outlet. The instructions state to be sure to connect the antenna before connecting the power cable. Below you can see the back of the cradle with the antenna and power cables plugged in. Note the slot for hanging the cradle on the dashboard mount, had I elected to use it. While mounting the phone would have helped a bit with the cable mess, I don’t really have a viable place on the dash to mount the phone where I can reach and see it. For a permanent solution, I would need to invest in one of weBoost’s optional alternative mounting accessories. Okay, that’s the setup. Time to power up and test? Not so fast! There is a big warning label in the instructions and on the website stating that the device must be registered with your wireless provider before use. I guess that this is part of the agreement with the FCC to approve this class of product. If your carrier or the FCC requests that you discontinue use of the device to eliminate signal interference, you must do so. So I called my carrier, AT&T, to ask about device registration. The friendly support rep that I talked to was aware of these products, because her husband had one, but could not find any registration process nor policy against their use. While others who bother to check with their carrier may have different experiences, I felt that I had sufficient blessing to move forward. I powered up and generated a green LED on the cradle. One additional note on power before I discuss the test results. 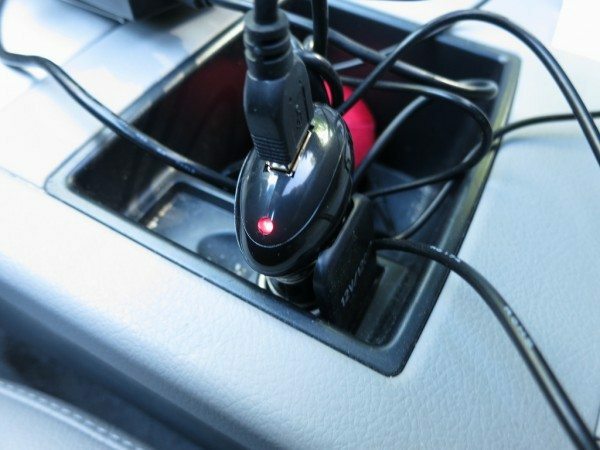 The user guide warns that only their provided adapter should be used and, furthermore, it should be unplugged when leaving the car to avoid discharging the car battery “in a day or two.” Many cars’ DC outlets automatically power down with the ignition off, including mine, but you should make sure this is the case with your car before leaving it permanently plugged in. I tested signal strength with an app call Network Signal Strength. Signal strength is measured in decibel milliwatts (dBm). The lower the negative number, the better. “Good” values differ on different types of networks. Where I live, I might get desirable LTE signal but revert to GSM if the LTE signal is too weak. I tested several locations, moving gradually over several miles away from my house and toward civilization. In each scenario I measured LTE signal. The system went from borderline poor to good, and from 1 bar to 3 bars. Fantastic! In one other test right next to the house, I found myself connected to the AT&T microcell inside the house, which gave me a -91 dBM GSM signal. 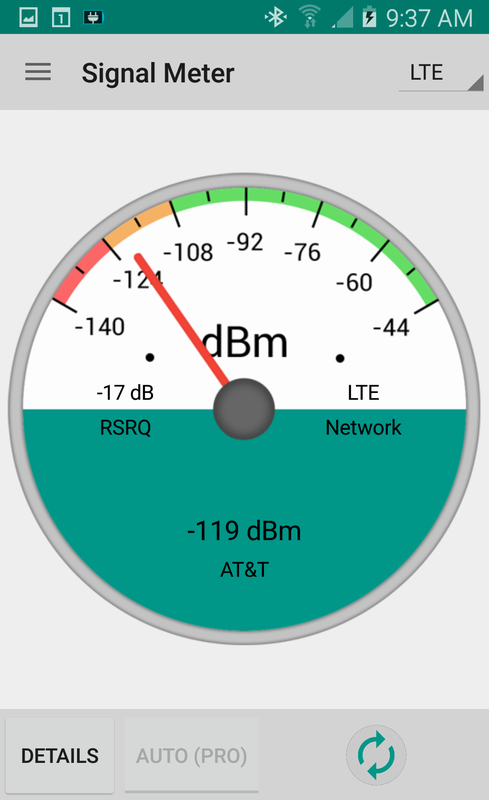 When I powered up the Sleek 4G, the received LTE signal improved enough that the phone switched to the LTE AT&T tower signal, giving me 3 bars of coverage at -93 dBm. That’s the equivalent of going from a poor to good signal. So, I observed improvement in all areas. Sleek 4G made poor coverage acceptable and good coverage excellent. Feeling cocky, I decided to go for broke and see if I could maintain a connection on a call to my mother without dropping her before I got home (the usual scenario). The result was a clear call all the way into the garage! So, I can give performance of the Sleek 4G not only my endorsement, but Mom’s seal of approval. The bottom line on the Sleek 4G is that it works. That doesn’t mean it’s for everybody. 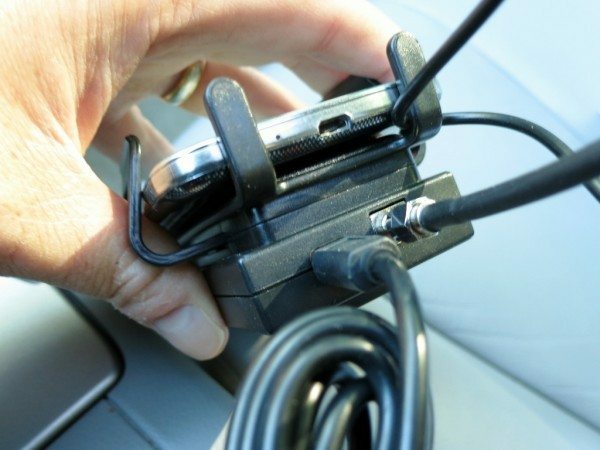 You need to be frustrated enough about dropped calls or streaming performance in your car to shell out about $200 (or more for a non-adhesive mount kit). You need to live with some degree of cable mess in your car and any work required to minimize it. 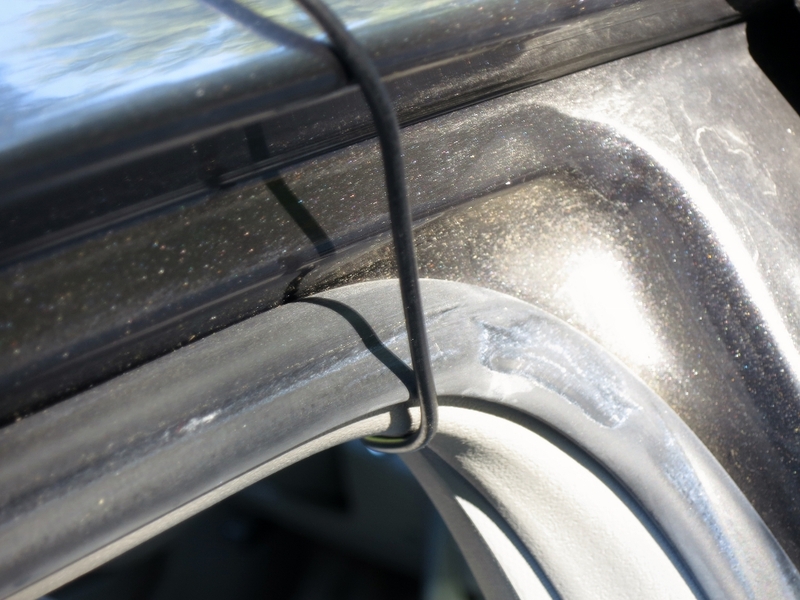 You probably need to remember to remove the antenna when you go through a car wash. (Side note: When I removed mine after a week, some of it parked in hot sun, it left a faint ring of gooey residue, probably melted adhesive from inside the assembly.) And, for us forgetful types, having to put the phone in the cradle increases the odds of leaving it in the car at the next stop. So, nothing’s perfect. But, like the doc told me about my inevitable knee replacement surgery, “You’ll know when you need it.” And, if you need it, the Sleek 4G will eliminate a lot of frustration. As for me, the verdict’s still out. I don’t drive a heck of a lot, and I’m not one of those people who has to be on the phone constantly when I do. 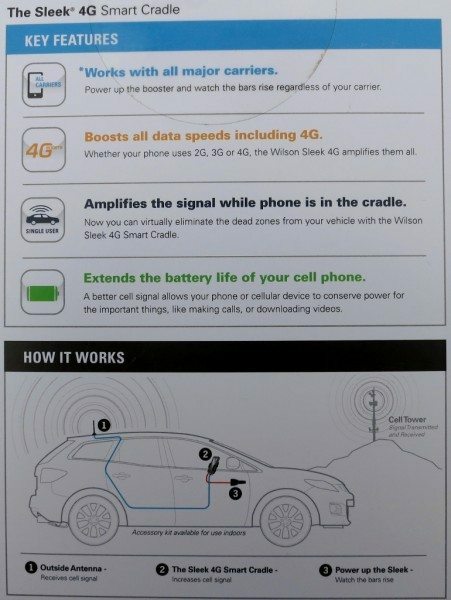 But the next time I hang up on Mom might be just the nudge I need to spend a little time making a clean, permanent installation of the Sleek 4G in my car. Source: The sample for this review was provided by weBoost. Please visit their site for more info about this product or Amazon to order.